Hysterectomy is a commonly performed surgical procedure in women. It has been associated with improvements in physical and mental quality-of-life measures, body image, and aspects of sexual activity. Hysterectomy involves removal of the body of the uterus with or without removal of the cervix (neck of the womb). For some conditions, the fallopian tubes and/or ovaries may need to be removed at the same time. If both the body of the uterus and the cervix are removed, it is referred to as a total hysterectomy. 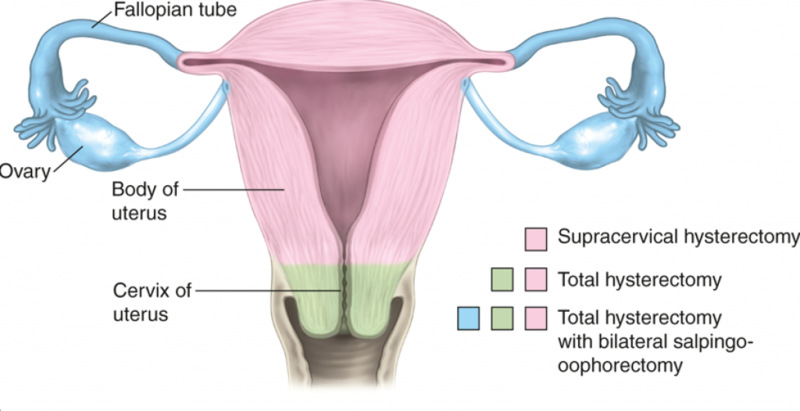 If the cervix is left in situ, it is termed a subtotal or supracervical hysterectomy. Reasons for choosing this operation are numerous and span both benign and malignant conditions. It is good practise to consider and attempt conservative/non-surgical management options before embarking on a hysterectomy, which is a major surgical procedure. Examples of benign conditions where hysterectomy may be the treatment of choice include uterine fibroids, adenomyosis, endometriosis, uterine prolapse and abnormal uterine bleeding. Although this procedure is generally highly successful in curing the disease of concern, there are accompanying risks and potential complications, necessitating a comprehensive and patient-centred informed consent process. Vaginally – the uterus, including the cervix, is removed through the vaginal route. No incisions are made in the abdomen. A vaginal hysterectomy can either be carried out under a general anaesthetic (you will not be awake during the procedure), or spinal anaesthetic (similar to an ‘epidural’ where you will be numb from the waist down, but awake). A vaginal hysterectomy is usually preferred over an abdominal hysterectomy because it is less ‘invasive’ and involves a shorter stay in hospital. The recovery time also tends to be quicker. Abdominally – through a laparotomy incision (larger incision in the abdomen). This is the traditional route through which hysterectomies are performed but has been largely superseded by the laparoscopic or vaginal routes. This may still be the preferred route for large fibroid uteri or in some gynaecological cancers. A general anaesthetic is required. Laparoscopically (‘key-hole’) – using minimally invasive techniques. A number of small incisions are made in the abdomen through which a telescope and specially designed instruments are placed. This route has significant advantages over the traditional abdominal method. However, advanced surgical training and expertise are required. Laparoscopic hysterectomies are done under general anaesthesia. Robotically assisted – this is a relatively new technique and is not yet widely available. Sometimes a combination of routes may be required, such as in laparoscopically-assisted vaginal hysterectomy or laparoscopic hysterectomy combined with a mini-laparotomy to remove the uterine specimen from the abdominal cavity. Note: In some instances, it may be worth deferring surgery until your health is optimised. Anaesthetic risk: Your risk of anaesthetic-related complications will depend on the type of anaesthesia you require and your own past medical history (comorbidities). Should your medical history place you at risk, a preoperative assessment by a senior anaesthetist is recommended. Blood clots in the veins of the legs and/or chest (‘venous thrombo-embolism’) – approximately 0.5-1% of cases. Early mobilisation is important to prevent blood clots. Some women with specific risk factors for blood clots may be advised to take blood-thinning injections postoperatively. Injuries to structures such as the bladder, bowel, ureters (tubes that connect the kidneys to the bladder – 0.1-2% of cases. Certain conditions such as adhesions (scar tissue) where organs are adherent to each other, increases the risk of injury. Bleeding – all major surgery carries a risk of haemorrhage. Haemorrhage is more likely if the hysterectomy is more challenging e.g. bigger fibroid uteri. A blood transfusion may be necessary but this is relatively uncommon.